Which Dental Crowns Are Best? Let me tell you which dental crowns are best. In dentistry a crown is used to rebuild or strengthen a broken or compromised tooth. Crowns can also be used in order to improve the shape and appearance of a natural tooth. As the word describes a crown is fitted like a crown onto a tooth which is prepared by a dentist. The tooth is prepared for a crown by being shaped accurately for a dental crown to be eventually fitted over. Once the preparation is complete the dentist will take an impression to record the shape and position of the tooth for the definitive crown to be made. This impression is then sent to the dental laboratory for the crown to be made. Crowns can be made of several different types of materials. 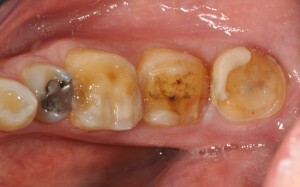 Crowns generally can be tooth coloured or metallic. Tooth coloured crowns are made from different types of porcelains, ceramics, resins composites and zirconia ( to name a few ) Metal crowns can be made from several different types of metal alloys. Here we have an example of which crowns are best. It is more common today for patients to prefer tooth coloured restorations. Cosmetic dentistry revolves around the improvement of ones smile and appearance of teeth. Teeth are supposed to look and function like natural healthy teeth. However this is not always possible. The molar teeth are designed to grind food, hence they withstand large biting forces hence the material and the design of the restoration needs to be carefully planned. In this case the material which was used could not withstand the forces of biting during function hence they broke soon after fitting. 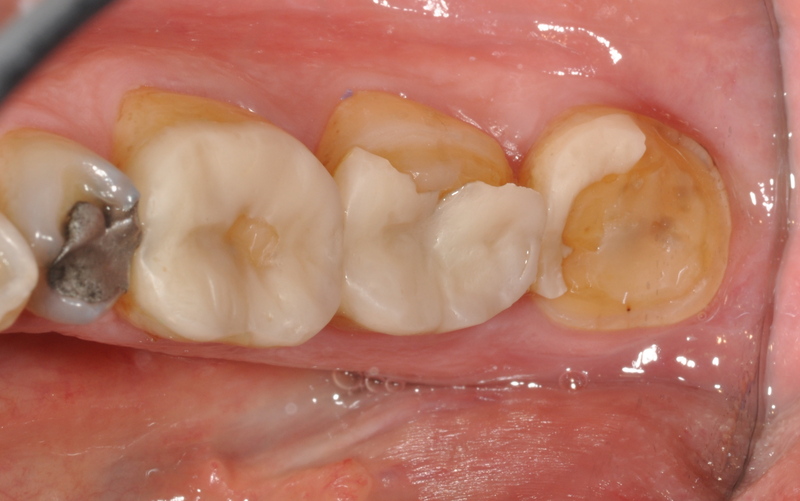 Ceramic is a great material for making dental crowns, however sufficient thickness needs to exist in order for the material to withstand the usual biting forces. In this instance the material was not thick enough and this was the main cause of the crowns fracturing. In order to make the material thicker the dentist would need to allow for more material ie the teeth would need to be reduced more than they were. If the patient really wanted to have white crowns then the dentist would need to reduce the natural teeth even further and this could cause future problems of root canals being needed, infections, senstivitiy or even extraction. The previous dentist didnt want to over trim the teeth hence the crowns were thin and that is why they broke. We explained this to the patient carefully and advised that perhaps changing to a different material like precious gold alloy may be the best solution. Gold dental crowns are much stronger than porcelain crowns. In addition to the strength the gold crowns dont need to be as thick to withstand large biting forces. 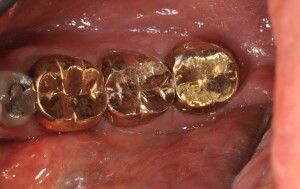 It was suggested to the patient that no additional trimming of the natural teeth would be required if the patient chose gold as an alternative for the crown material. 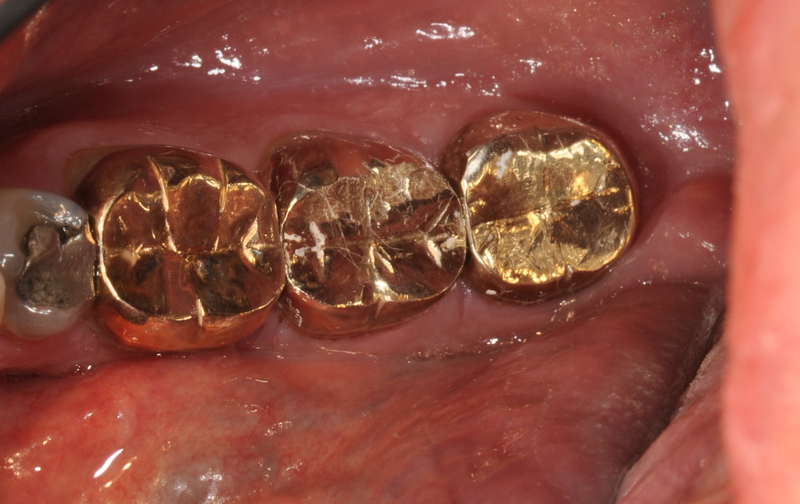 Initially the patient was keen on the idea of having white crowns on the molar teeth however after the explanation of what complications could arise when the teeth are trimmed, he decided to opt for gold crowns instead. The old crown material was removed carefully and impressions were taken and sent to the laboratory. A few days later the new crowns were fitted. The results were fantastic and the patient was very happy indeed. No more broken teeth and the crowns have been functioning now for 9 months without any problems. Gold is generally accepted as a better material for back molar teeth. It is softer and less abrasive to opposing and adjacent teeth. However it is not usually the first choice for patients as most patients want white natural looking teeth.